FAQs for Judicial officers and court staff can be found on the Law Library of Victoria's Intranet (login required). 1. Can I access the internet in the library? 2. Can I access research databases in the library? 3. Can I borrow items? 4. Can I photocopy or scan in the library? 5. Can I recommend items for the library to purchase? 6. How do I access the collections of the Law Library of Victoria? 7. How do I find a printed resource in the Law Library of Victoria? 8. How do I get assistance using the legal databases? 10. What are the copyright and licensing restrictions? 11. What court libraries and jurisdictions are included in the Law Library of Victoria? Yes. Use the Supreme Court Library's wifi or one of the computers on the ground floor, Level 1, Level 2 in Room A. Yes, you can access online resources at the Supreme Court Library using one of the computers on the ground floor, Level 1, Level 2 in Room A. Members of the legal profession can borrow from our general collection for one day only if it is for court purposes, and items from our lending collection (Level 2 in Room A) for two weeks. Members of the public cannot borrow items from the Law Library of Victoria, however you can come in and use items in the library. Alternatively, bring a USB and you can scan to USB. No charges apply if it is library materials being photocopied or scanned. Copyright restrictions apply to the photocopying of library material. Please read the copyright notice. 5. Can I recommend an item for purchase? Yes, we welcome purchase suggestions, email them to llv@courts.vic.gov.au. Visit the Supreme Court Library to access print material and online resources. View our Collection map to assist in finding your way around the collection. You can find print material by searching our Catalogue. You can also check our Holdings List (PDF, 3MB), which is a complete list of the Supreme Court Library’s holdings of journals, law reports and legislation. Speak to a librarian at the Supreme Court Library Reference Desk. The Supreme Court Library is open Monday - Thursday 8:30am - 6pm and Friday 8:30am - 5pm. Access to the County Court, Magistrates' Court, and VCAT libraries is for judicial officers, tribunal members, and court staff only. The Victorian Bar Library (Richard Griffiths Library) is available to Victorian Bar members only. Copyright restrictions apply to the use of print material, online resources and for photocopying. For more information see the website of the Australian Copyright Council. 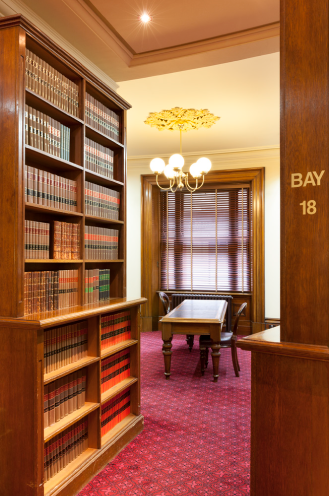 The Law Library of Victoria manages the libraries of the Supreme Court, the County Court, the Magistrates' Court, and the Victorian Civil and Administrative Tribunal (VCAT) and the Victorian Bar. We also provide services to the Children's Court, Coroners Court, Court Services Victoria, Judicial College of Victoria and the Judicial Commission.